Australian knife laws are no picnic. And neither are picnics, if you can’t even use a plastic knife to slather mayo on your…well…whatever Aussies eat with mayo. 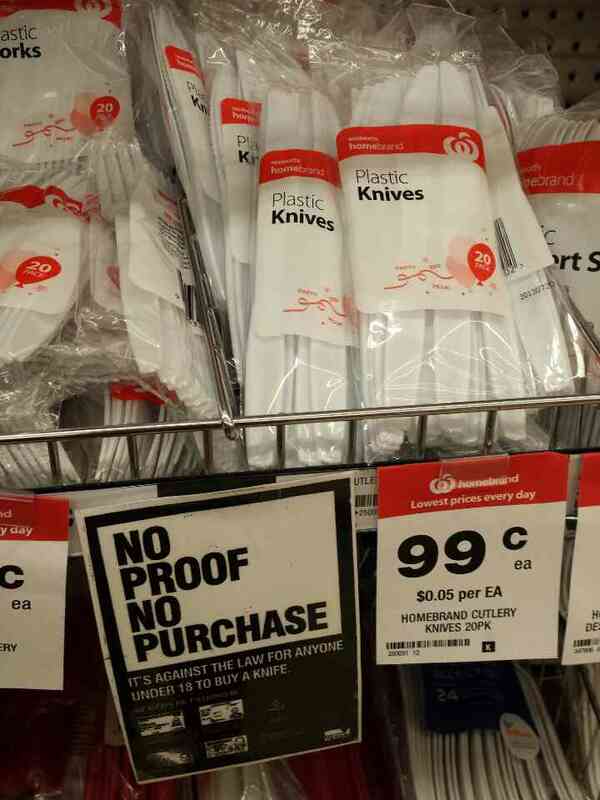 This photo was taken in a supermarket in Australia, and it shows how seriously f**ed up Australia’s knife laws are. Retailers in Victoria face fines of $2389 for each offense if they’re caught selling knives (even dull plastic ones) to anyone under the age of 18. This is what “reasonable” knife laws look like (and gun laws too), when chicken-livered politicians listen to hoplophobic ninnies. Okay, I made that part up. But where does Australia’s (plastic) knife control end and (plastic) spatula control begin? Can you sell a metal fork to a juvenile, knowing that he or she will use the edge of it to cut their food? Or is it illegal for a minor to use something as though it were a knife, even if it’s not? Once this stupidity starts, it never seems to end. Australia, we pity you. Sigh. All I can say is God Bless America. Because no matter how stupid it gets here, somewhere else makes our rules look like they were handed down graven in stone. Mcliver? Seriously, you combine 2 of the nastiest things on planet earth, MacDonalds and liver and put them together in one word. Have you no soul? Do they spread it with knives? Do they slather it with mayonnaise with knives? We need some input from a real Australian. I’ve never been there (but it’s on my bucket list) and ‘Outback Steak House’ probably isn’t any more authentically Australian than, say, burritos or foie gras. I had some vegemite once. I don’t know what it’s made of, but it resembles axle grease in appearance and consistency and tastes like…I’d say it tastes like axle grease or poop or pond scum or rotten avocadoes, but I haven’t tasted those things. I can only imagine that they’re as nasty as vegemite. Sorry, Oz is has gone off the deep end trying to become England. Any knife with a folding blade and a lock that is able to be opened with one hand is basically illegal. It’s for the children. Here is an interesting read that will turn your stomach. I saw this picture on a Facebook post about England make similar restrictions on knives. If these stories are really true, then the Australia’s and England’s leaders have lost their minds. Blaming guns is one thing, but blaming knives, that is just crazy.